"All my life I had a need to think painting, to paint in order to liberate myself from all the impressions, all the feelings, and all the anxieties of which the only solution I know is painting." When Nicolas De Staël leapt to his death from an apartment balcony in 1955, aged just 41, he left behind a body of work suggesting a stunning and singular painterly vision just emerging into full clarity. 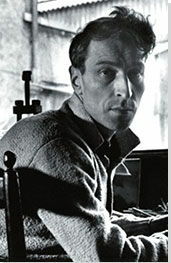 Part of the second great generation of European abstract artists, he came of age in post-1945 Paris, in the company of the Tachiste painters, whose 'pure', improvisatory and non-geometric abstraction provided a similar set of contexts and constraints as Abstract Expressionism in post-war America. A more figuratively inclined artist than many of his peers, more studious in his attention to picture construction, de Staël opened up a mesmerizing space in between representational and non-representational art, inspiring figures from Jean-Luc Godard - whose early cinematography is said to have been influenced by de Staël's color-palette - to the St. Ives School painters. The vibrancy of de Staël's work, and the success he was already achieving by the mid-1950s, makes his early death all the more puzzling and poignant. For de Staël, figuration and abstraction were never mutually exclusive categories: a truism perhaps, but one borne out with such arresting effects in his work that it presents itself as an urgent and previously undiscovered truth. His aim was neither to represent things directly, nor to bow to the total abstraction of his French and North-American contemporaries. Instead, de Staël's was interested in the suggestion of volume, space, and distinct forms in the barest possible terms, alluding to external stimuli without ever giving in to a wholly figurative process. A friend of the great Cubist painter Georges Braque, it is perhaps no surprise that de Staël became known for a thick impasto technique involving wide planes of color, loosely suggestive of the plane-fracturing exercises of Braques and his friend Pablo Picasso in the early twentieth century. Often applying his paint with a spatula, de Staël created sculpted and ridged canvases which retained something of the spirit of geometrical abstraction, in an era when the Tachistes and Abstract Expressionists alike were turning their ire against it. De Staël's suicide presents a puzzling quandary, given that by the end of his life - with the exception of the last few months - he was moving broadly towards a bolder and brighter color-palette, and engaging more unabashedly with the external world through his work, producing a number of stunning abstract landscapes. These developments, responsive in particular to the light and atmosphere of his new Provencal home in the early 1950s, suggest some process of emotional liberation, and offer few clues as to the inner struggle from which they obviously emerged. Nikolai Vladimirovich Staël von Holstein was born in St Petersburg in 1914. His father was a general of noble descent and governor of a garrison in the city, the Fortress of St Peter and St Paul. Nikolai enjoyed a comfortable existence for the first few years of his life, in spite of Russia's entry into the First World War, but following the revolution of 1917 the family was forced to flee to Poland, where they resettled in 1919. The family's two parents died within a year of each other, in 1921 and 1922, and Nicolai and his two sisters moved to Brussels to live with a Russian family, following a well-established pattern of Russian emigration to the Francophone world. It was around this time he began to be known as Nicolas de Staël. This relatively early work, a portrait of the artist's first wife Jeannie Guillou, was painted in Nice while the two were living there after de Staël's demobilization from the French Foreign Legion. As in lots of de Staël's early portraiture, the sitter has a pensive, downcast expression, and the color palette is muted and melancholy. The blue and yellow color-scheme, and the veiled head, gives Jeannie an undeniably Marian quality, perhaps indicating the partial inspiration for the piece in post-Renaissance religious art. De Staël's work from this period, that is, has been seen as reminiscent of the Mannerist portraiture of El Greco (1541-1614) in its expressive elongation of human limbs, and its atmospheric, brooding use of color and shading. At the same time, those qualities, as well as the dominance of shades of blue, are suggestive of Picasso's so-called "Blue Period" (1901-04), when severe depression led the artist to create expressionistic portraits of everyday human subject-matter. Putting aside these finer points of stylistic association - which have been seen to make de Staël's early-1940s work somewhat derivative - the most obvious point of contrast from the work that followed is the directly representational quality of the piece. That representative function also roots the portrait in biography, in a way which grants it a certain poignant clarity. Jeannie would later die of malnutrition in Nazi-occupied Paris, and it seems clear from the mood of this piece - notwithstanding its similarity to much of de Staël's work from the period - that the sitter is already unhappy, perhaps unwell. De Staël's marriage to his second wife shortly after Jeannie's death belies his heartbreak at losing a creative as well as romantic companion, and it is tempting to infer that this episode - and the privations of war generally - compounded the depression that would trouble him for the remainder of his life. This work is one of the earliest in which de Staël demonstrated a coherent and wholly individual approach to painting. Standing at nearly two meters high, the sheer scale of Painting bespeaks a confidence and ambition that is remarkable given the early stage of the artist's career. The work is mainly composed from sweeps of muted brown, grey and black, the limited range of colors suggesting de Staël's acute sense of visual purpose at this time. He was evidently generating his work in compliance with strict, self-imposed formal parameters, somewhat like the strict tenets of Braque's Analytical Cubism, whose influence on the work seems clear. A further constraint apparent in Painting, and a significant trait in all of de Staël's mature work, is the use of untainted patches of color, each executed using a single, unmixed hue. At the time this painting was composed, de Staël was part of the Second School of Paris, a loose-knit group of abstract artists working in Paris after the Second World War associated with but not limited to the output of Tachiste artists such as Jean Fautrier. But de Staël never rejected figuration out of hand in the way that Fautrier did, for example. In this work, painterly activity is the center of the canvas, leaving a dark grey ground around the edge of the picture. A contrast between the activity at the center of the painting and the dead space at its edges gives the impression that some distinct entity has been rendered at the middle of the work. This is not merely an exercise in abstract painting, then, and though there is no clear referent - as de Staël made clear with his nondescript title - the composition seems to hint at a figural presence. At the top, the silhouette of a face seems to emerge from the sweeping brushwork, while several broad arcs in the body of the painting suggest limbs in motion. De Staël would use similarly vast canvases for the rest of his life. But it is the formal rigor of Painting, involving highly productive, self-imposed technical constraints, which indicates the most significant thread of continuity with his later work, and on which his critical reputation rests. De Staël's friend and critic, Denys Sutton, wrote that his output between 1945 and 1947 was "dramatic and violent, yet fundamentally disciplined", a description highly applicable here. Composition shows an intensification in de Staël's painting practice, involving fewer figural suggestions, and an overwhelming focus on the internal relationship between colors. It is telling, however, that de Staël retains a 'ground', a grey-green rectangle of color into which he inserted his distinctive panels of thickly applied grey paint. Through such minimal concessions to traditional representative technique, he was able to balance the demands of figuration and abstraction, demands hotly contested in the European and American art movements of the post-war. By maintaining a relationship between the ground below and 'figures' on top, that is, de Staël was able to retain a sense of space, a gesture disallowed to artists practicing the various forms of 'total' abstraction then in vogue in France and America. As the critic Douglas Cooper wrote of de Staël's output in 1951-52, "in these paintings one feels that the artist is striving towards a figurative image, because the tesserae serve a structural purpose and suggest solid forms." Composition also shows a self-sufficient enjoyment of surface effects which defies the sullenness of de Staël's contemporaries. At the same time, he was not concerned about whether his paintings were representational or not: his artistic interest lay exclusively in the relationship between compositional forms and colors. These interests are clearly registered in Composition by the rich agglomeration of paint, and the subtle internal rhythm of its coloring, so finely modulated across the surface of the work that no two panels of color seem exactly the same. Though it may seem like a typical 'period piece', then, it is important to grasp just how unusual a work like Composition was in the years after the Second World War. While many School of Paris painters were pursuing a messy, often violent-seeming variant of abstraction, and while the American Abstract Expressionists were developing an applied theory of Action Painting, de Staël was walking a fine line between these interests, on the one hand, and a more conventional, representational manner, on the other. He would often refer pejoratively to his abstract peers as the gang de l'abstraction-avant - a pun on traction-avant, meaning "front-wheel drive" in French. In retrospect, works like Composition seem to presage the more striking turn back towards representation in the works of de Staël's final years. In Mediterranean, Le Lavandou, de Staël applies the same brilliant red, white and blue color scheme as in the series that he had just completed, Les Footballeurs, while transitioning to the landscape subject-matter that would dominate his output until his death. His palette was growing brighter at this time, and the titular reference to a landscape of some kind is borne out in an obvious distinction between sky above and earth below, though both are painted blue. Nondescript figures intervene around the line of the horizon, but as with all of de Staël's mature works, no single detail describes any specific 'thing'. Mediterranean, Le Lavandou belongs to a small group of works created during a transitional phase in the artist's career, prompted by a visit to the coastal town of Le Lavandou in south-eastern France. In spite of the downward psychological trajectory implied by his suicide a few years later, the critic Stuart Jeffries has described de Staël as "a painter hungry to paint beautiful things", and the truth of this statement became more and more apparent towards the end of his life. Not only is it evident in his turn towards the sun-drenched landscapes of Provence as subject-matter, but his handling of paint in works such as this is sumptuous. Paint is applied in thick layers, using a spatula, a technique suggested by his friend Jean Bouret in the year this work was executed. This meant that paintings could be structured not only by color-distinction but also by differentiating between areas of identical color. In the upper part of this work, for example, it is obvious even in reproduction how thickly de Staël has layered his paint, and the threshold of each stroke of the spatula is marked by a ridge-like edge. This painting thus demonstrates the novelty and fluency of de Staël's technique at this point in his career. In occupying the absolute cusp between figuration and abstraction, works such as Mediterranean, Le Lavandou suggest the spirit of the place evoked by the title while remaining numinous and allusive. This was arguably de Staël's most important contribution to European art history: to show that abstraction and figuration were not absolute terms, and that a compromise between the two was not just possible but, in the right hands, capable of producing spellbinding effects. This painting depicts the artist's daughter, Anne, who was ten years old at the time. It is a rare example of an explicitly labelled portrait in de Staël's oeuvre, created at a time when his work was increasingly admissive of external reference-points. Indeed, from around 1952 onwards, similar descriptive titles become more common in his oeuvre, while names like 'painting' or 'composition' become less common. At the same time, de Staël was evidently uninterested in the precise details of his sitter's form: only a loose outline of the body, and the red of the face and blue of the hair, suggest a human presence on the canvas. His main interest lay, as before, in matters of formal execution: in this case, the work is vividly painted, with gestural sweeps of a wide, loaded brush. A markedly lighter and softer palette is also employed than in most of his previous works - the pastel pinks at the center, in particular, offer a harmonic touchstone around which the rest of the work gravitates. With regards to this harmonic brilliance, the critic Stuart Jeffries has suggested that "there is something terribly wrong with the joyfulness of these paintings, given that the best of them came in the wake of the Second World War and in particular the French experience of war, rich in human suffering, collaboration, resistance, deportations and devastation." In spite of this apparent "joyfulness", de Staël was indeed painfully effected by the War. As Denys Sutton noted, he was "forced to watch his beloved friend, Jeannie", Anne's mother and de Staël's first wife, "die of malnutrition and illness" during the Nazi occupation. Taken together, de Staël's life circumstances and his artistic output during the early 1950s seem to pose a fascinating and perhaps unanswerable question about the artist's state of mind. Though the distinction between the upper and lower half of the painting resembles the sky-and-ground format of Le Lavandou, there are fewer definite reference-points in Agrigente. At first glance, one is tempted to simplify the picture scheme: a beach or cliff edge perhaps, the deep blue of the sea at the horizon, the sky above, maybe a small blue beach ball in the foreground. Sustained attention undermines this interpretation, however, as the landscape dissolves in a surfeit of enigmatic detail - including the panel-like oblongs at middle right. In the end, the brilliant slabs of color and prominent ridges of smooth, spatula-applied paint seem to stand only for themselves. The title of the painting refers to a hilltop city on the southwest coast of Sicily that de Staël visited in August 1953. The trip was highly productive, and this work is one of several vibrantly colorful works that de Staël made while there and following his return to Provence. Another source of inspiration had been a visit to England in 1951, during which de Staël became immersed in the work of William Blake, John Constable, and, above all, J.M.W. Turner. The vivid contrast of blue and yellow in Agrigente seems tacitly related to Turner's unfinished painting of Norham Castle, which is based on a similar color contrast. The impetus provided by these combined influences makes the use of color in the Agrigente works markedly different from anything de Staël had previously created: far more vibrant, and suggesting a freer handling of paint. Denys Sutton has remarked that "in his short career [de Staël] renewed himself with astonishing rapidity and each step in his evolution assisted in the renewal of painting itself". This work is one such demonstration of the extraordinary renewal of which de Staël was capable; one can only speculate how many more renewals might have occurred had his career not been cut so short. This is characteristically simple painting from the final phase of de Staël's career employs just five, mainly muted colors, ranging from pale greys through soft blues to the deep black which stands out in a square in the left foreground. As in most of his earlier works, there is no clear figurative referent, despite the descriptive title, but a comprehensible relationship nonetheless exists between the title and the picture. We can't precisely identify the snow or the town, but the color-palette and structural arrangement convey the mood of these things. In distinction from his earlier Provencal-phase works, however, there is a quality of refinement and spaciousness here, which has to do with the use of a minimum of painterly components: of shapes and colors. While he continued to create planes of thickly applied, unmodulated paint in the final year of his life, the planes grew larger, and less sensuously expressive. In Marseille under the Snow, vast sweeps of cool blue instead seem to encompass the canvas. The mood and technical composition of this work exemplify the very last phase of de Staël's career, when he returned once more to a limited color-palette, and focused his attention on purer, simpler compositional arrangements. 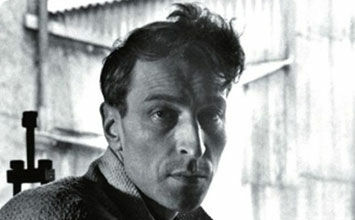 As his critic and acquaintance Douglas Cooper wrote, by the time of his death de Staël was exhibiting a new "virtuosity and purity in his handling". At the same time, it is tempting - though perhaps unjustified, given the precise logic of formal development which also defines his career - to read into this final modulation of his style some kind of mental or emotional regression: a retreat from the simple, sensual enjoyment of the world which comes across in works such as Agrigente, and the Footballeurs series.